Pumpkins are something of a natural two-for-one deal. Whether you use them to make jack-o-lanterns or pie, all pumpkins contain a valuable prize in their pulpy core -- nutritious, edible seeds. Also known as pepitas, pumpkin seeds are dark green, flat, mildly sweet and tender, much like the seeds of other kinds of winter squash. Although some pumpkin varieties produce seeds without shells, most pumpkin seeds are encased in a cream-colored shell, or hull, that is just as edible as the kernel it protects. Shelled pumpkin seeds, or kernels, are a mineral-rich source of unsaturated fatty acids and quality plant protein. A 1-ounce serving of pumpkin seed kernels has right around 160 calories, 14 grams of mostly unsaturated fat, 8 grams of protein, 2 grams of carbohydrates and almost 2 grams of dietary fiber. A serving also provides nearly 40 percent of the recommended daily value for magnesium and just over 30 percent of the recommended daily value for phosphorus, based on a 2,000-calorie diet. Pumpkin seed kernels are a good source of iron, zinc and niacin, too. Pumpkin seed shells get their chewiness from fiber, which is largely what makes whole seeds nutritionally different from the shelled variety. While the kernels are mostly fat and protein, the shells are mostly carbohydrates. For this reason, whole pumpkin seeds are approximately 20 percent lower in calories and 60 percent higher in fiber than the shelled variety. You’ll get about 125 calories, almost 6 grams of fat, 5 grams of protein, 10 grams of carbohydrates and 5 grams of dietary fiber from a 1-ounce serving of whole, roasted seeds. Although the shell itself isn’t a significant source of vitamins and minerals, it is an excellent source of zinc -- whole pumpkin seeds supply about 25 percent more zinc per serving than shelled seeds. You can eat whole seeds straight from the pumpkin, once you separate them from the pulp and rinse off the sticky residue. To dry the seeds quickly, spread them in a single layer on a baking sheet and set them in a 250-degree oven for about 20 minutes. Toss them with oil and spices, and roast them at the same temperature for another 20 minutes, cool and enjoy. If you prefer to eat just the kernels, spread the seeds on a sheet of parchment paper and use a rolling pin to crack the shells. In a pot of boiling water, the cracked shells will open and release their kernels. Discard the shells, rinse the kernels and let them dry. Because of their high oil content, pumpkin seeds -- like all nuts and seeds -- are prone to spoil quickly. Whether you buy them in a package or from a bulk bin, avoid pumpkin seeds with cracked shells. 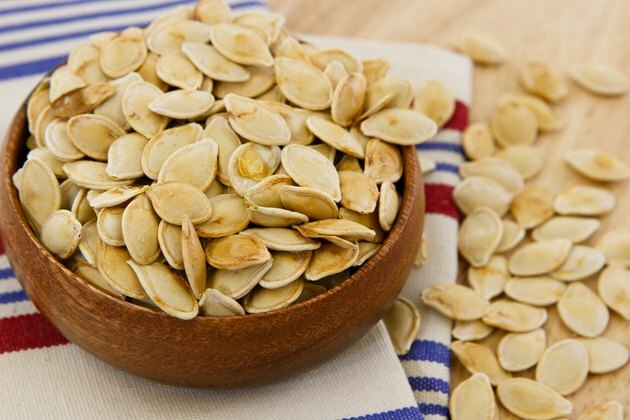 With or without the shell, pumpkin seeds should be kept in an airtight container and stored in the refrigerator, unless you plan to eat them soon after buying them. Pumpkin seeds generally keep for two to six months in the refrigerator. If they smell like mildew or oil paint, chances are they’re rancid and should be discarded.